Please always check the church website to confirm these times. 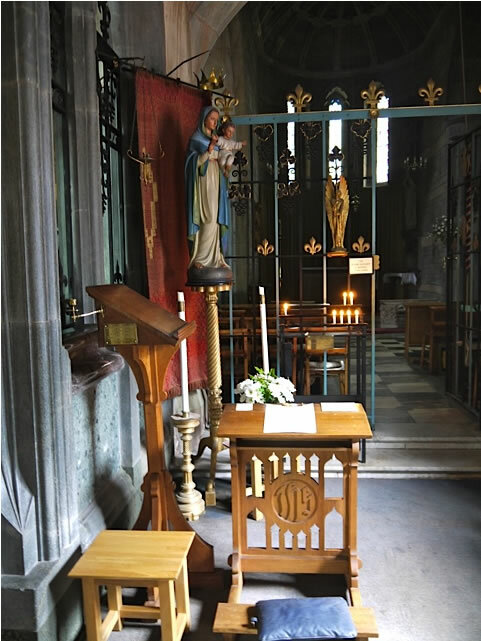 Third Sunday of the month: Family Service at 10.30 a.m.
Wednesdays: Eucharist or Morning Prayer 9.30 a.m. The Parish Church of Shaldon. In the 1890s St Nicholas at Ringmore was the Parish Church. 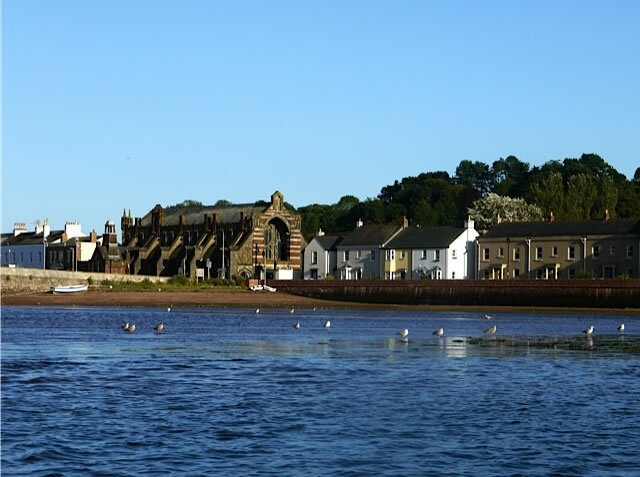 At this time there was a greater proportion of people living in Shaldon rather than Ringmore, despite Ringmore having been the centre of the Parish since before Domesday! The Vicar felt this justified moving the Parish Church to Shaldon. He purchased Gowrie House and a part of its garden for £200. The church Architect, Edmund Sedding, designed a church with Chancel, Nave, north & south Aisles, and a Lady Chapel on the south-east. It was designed to hold 450 people. A plan to add a tower was abandoned due to worries about the foundations. Stone came from both the Ness and from Babbacombe, with some reclaimed from the demolition of Gowrie House, and the green colored courses of stone in the external walls are Polyphant from Cornwall. 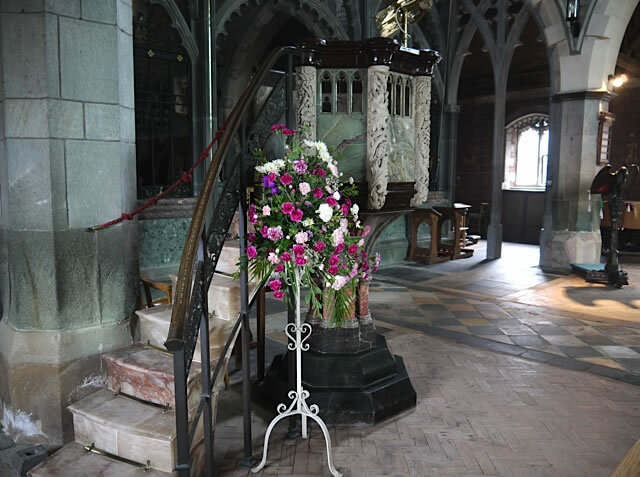 Polyphant is used in several other places in the Church, for example in the columns supporting the arcade of arches. The Screen is of particular note. Beautiful tracery in Polyphant with marble, and wrought ironwork, the tracery echoes theCrown of Thorns throughout the church. 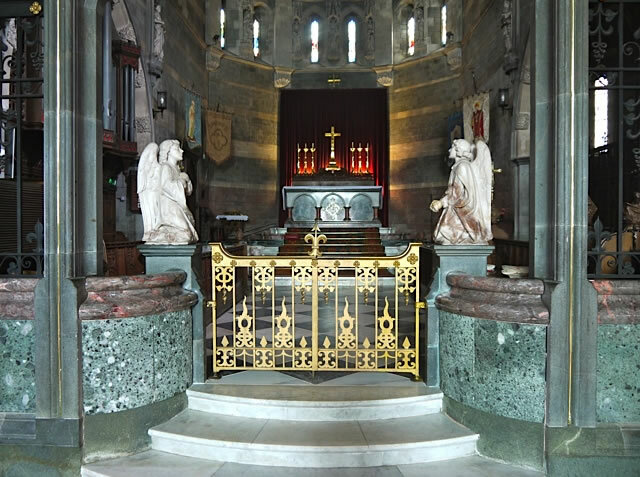 The top of the Screen carries 5 statuary figures, St Peter, and on his right the Virgin Mary and St Nicholas, and on his left, St John and St Paul. 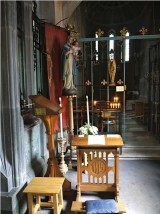 Over St Peter is the Crucifix – a true “Rood Screen”. also a figure in white marble – this is a figure of St John the Baptist holding a Clamshell. The roof with its barrel vaulting was inspired by the Vicar, who had seen the effect when in Italy. The slabs are all stone, and the original ones had to be replaced with thinner, less heavy ones. Shaldon Church is famous for its outstanding organ. Carlo Curly and organists from Liverpool and other Cathedrals have given recitals here. It is a 3 manual instrument with pedals that was rebuilt in 1985 and is considered one of the best in Devon. July 1902, becoming the Parish Church of the Parish of St Nicholas. The church is a Grade 1 Listed Building.